The March 2009 issue of the Guild newsletter has been posted out. Check your copy for a range of articles and the updated Guild events calendar. Don't forget to call the office to book your place in the presentation by Vikki Pignatelli at Epping Creative Centre, 2pm Saturday 2 May 2009: 10 Attributes that make a Good Quilter Better’. 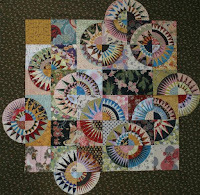 The Australian Machine Quilters Exhibition is an exciting new exhibition run by Victorian Quilters and open to ALL machine quilters (domestic and long-arm), with judging predominantly focused on the quilting. Entries are due on the 1st of June. You do not have to be a member of Victorian Quilters to enter. Entry forms and information can be downloaded HERE. The first Sunday social meeting for 2009 is this Sunday, 15 March. Entry forms CANNOT be submitted by fax or e-mail.